Nan Tien Temple and Cremorne Point to Mosman Bay Walk will appeal to history buffs. 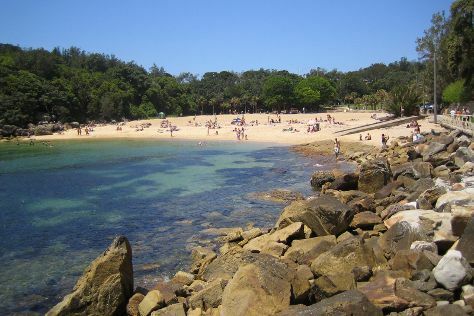 Visiting Wentworth Falls and Balmoral Beach, Mosman will get you outdoors. Explore the numerous day-trip ideas around Sydney: The Giant Stairway (in Katoomba), Shelly Beach (in Manly) and Hazelbrook Cottage Antiques (in Hazelbrook). Spend the 1st (Mon) wandering through the wild on a nature and wildlife tour. And it doesn't end there: enjoy the sand and surf at Palm Beach, tour the pleasant surroundings at Camp Cove, and pick up some local products at The Rocks Markets. For reviews, photos, where to stay, and other tourist information, go to the Sydney trip itinerary planner. If you are flying in from United Kingdom, the closest major airport is Sydney Kingsford Smith International Airport. In March, daily temperatures in Sydney can reach 30°C, while at night they dip to 22°C. Cap off your sightseeing on the 3rd (Wed) early enough to go by car to Nelson Bay. Nelson Bay is a suburb of the Port Stephens local government area in the Hunter Region of New South Wales, Australia. Kick off your visit on the 3rd (Wed): explore the galleries of Port Stephens Community Art Centre, then enjoy the sand and surf at Zenith Beach, and then enjoy the sand and surf at Fingal Bay Beach. To see photos, reviews, more things to do, and other tourist information, go to the Nelson Bay planner . You can drive from Sydney to Nelson Bay in 2.5 hours. Alternatively, you can take a bus; or do a combination of flight and bus. Expect a daytime high around 27°C in April, and nighttime lows around 15°C. Finish your sightseeing early on the 4th (Thu) to allow enough time to drive to Coffs Harbour. Start off your visit on the 4th (Thu): stop by The Yellow Shed, take in the exciting artwork at Bunker Cartoon Gallery, explore the landscape on two wheels at Coffs Creek Walk and Cycleway, then learn about winemaking at Two Tails Wines, and finally look for all kinds of wild species at Korora Lookout. Get ready for a full day of sightseeing on the 5th (Fri): enjoy the sand and surf at Diggers beach, then enjoy the sand and surf at Solitary Islands Coastal Walk, then explore the activities along Urunga Wetlands Boardwalk, and finally don't miss a visit to Cunningham’s Big Bunch. To see where to stay, photos, other places to visit, and more tourist information, you can read our Coffs Harbour day trip planner. Getting from Nelson Bay to Coffs Harbour by car takes about 4.5 hours. Other options: do a combination of taxi and bus; or do a combination of bus, train, and flight. Expect a daytime high around 28°C in April, and nighttime lows around 17°C. Cap off your sightseeing on the 6th (Sat) early enough to travel to Brisbane. Do some cultural sightseeing at Queensland Art Gallery and Queen Street Mall. Popular historic sites such as Catholic Old St. Stephen's Church (chapel) and Boggo Road Gaol are in your itinerary. Spend the 8th (Mon) observing fascinating marine mammals with a dolphin and whale watching tour. There's still lots to do: enjoy the sand and surf at Moffat Beach, appreciate the history behind Anzac Square, and take a stroll through West End. To see maps, where to stay, and tourist information, use the Brisbane online trip maker . Fly from Coffs Harbour to Brisbane in 4 hours. Alternatively, you can drive; or do a combination of bus and train. In April, daily temperatures in Brisbane can reach 30°C, while at night they dip to 19°C. Wrap up your sightseeing on the 9th (Tue) to allow time to travel to Hervey Bay. Discover out-of-the-way places like Burrum Heads Beach and Fraser Coast Wildlife Sanctuary. Do some cultural sightseeing at Ohana Winery & Exotic Fruits and Mary Ann Steam Locomotive. Take a break from Hervey Bay with a short trip to Palace Backpackers Memorial in Childers, about 42 minutes away. There's much more to do: tour the stables at Susan River Homestead Adventure Resort, appreciate the history behind Mary Poppins Statue, see the interesting displays at Bond Store Museum, and stop by Mind, Body and Soul. To see other places to visit, where to stay, reviews, and more tourist information, read Hervey Bay attractions planner. Getting from Brisbane to Hervey Bay by flight takes about 3 hours. Other options: drive; or do a combination of train and taxi. April in Hervey Bay sees daily highs of 32°C and lows of 20°C at night. Wrap up your sightseeing on the 11th (Thu) early enough to travel to Bundaberg. Bundaberg is a city in Bundaberg Region, Queensland, Australia. Start off your visit on the 12th (Fri): explore the activities along The Basin, then sample the fine beverages at Kalki Moon Distilling & Brewing Company, then tour the pleasant surroundings at Alexandra Park, and finally get lost in a book at Bundaberg Regional Libraries. On your second day here, view the masterpieces at Bundaberg Regional Art Gallery, look for all kinds of wild species at Sharon Gorge Nature Park, and then enjoy the sand and surf at Woodgate Beach. For ratings, traveler tips, where to stay, and more tourist information, read Bundaberg online travel planner . Do a combination of taxi and train from Hervey Bay to Bundaberg in 1.5 hours. Alternatively, you can drive. April in Bundaberg sees daily highs of 32°C and lows of 20°C at night. Wrap up your sightseeing on the 13th (Sat) to allow time to travel to Gladstone. Gladstone is a city in the Gladstone Region, Queensland, Australia. Visiting Lake Awoonga and Wild Cattle Island National Park will get you outdoors. Get some cultural insight at Gladstone Regional Art Gallery & Museum and Gladstone Maritime Museum. Venture out of the city with trips to Lions Park (in Miriam Vale) and Langmorn Station (in Raglan). There's still lots to do: tour the pleasant surroundings at Canoe Point Beach and Parklands and take some stellar pictures from Auckland Hill Lookout. For more things to do, where to stay, reviews, and more tourist information, use the Gladstone trip itinerary builder . Traveling by car from Bundaberg to Gladstone takes 2.5 hours. Expect a daytime high around 32°C in April, and nighttime lows around 22°C. Finish your sightseeing early on the 16th (Tue) so you can travel to Noosa. Double Island Point Lighthouse and Caloundra Lighthouses will appeal to history buffs. You'll explore the less-touristy side of things at Marcoola Beach and Queensland Air Museum. You'll find plenty of places to visit near Noosa: Buderim Forest Park (in Buderim), Point Cartwright (in Mooloolaba) and Gardners Falls (in Maleny). To see ratings, photos, more things to do, and other tourist information, go to the Noosa trip itinerary maker app . The Route module can help you plan travel from Gladstone to Noosa. Finish your sightseeing early on the 19th (Fri) to allow enough time to travel to Gold Coast Hinterland. We've included these beaches for you: Burleigh Head National Park and Tugun Beach. Discover out-of-the-way places like Greenmount Beach and Robina Town Shopping Centre. Explore Gold Coast Hinterland's surroundings by going to Springbrook National Park (in Springbrook), Coolangatta (Snapper Rocks, Captain Cook Memorial and Lighthouse, & more) and Fingal Head Lighthouse (in Fingal Head). To see photos, traveler tips, ratings, and more tourist information, read Gold Coast Hinterland trip planner . Getting from Noosa to Gold Coast Hinterland by car takes about 3 hours. Expect a daytime high around 30°C in April, and nighttime lows around 19°C. Finish up your sightseeing early on the 22nd (Mon) so you can travel to Byron Bay. On the 23rd (Tue), explore the galleries of Hammer and Hand Byron Bay Jewellery and Metal Collective, contemplate the waterfront views at Lake Ainsworth, then kick back and relax at Lighthouse Beach, and finally pause for some serene contemplation at Bexhill Open Air Cathedral. Get ready for a full day of sightseeing on the next day: learn about all things military at Ballina Naval & Maritime Museum, explore and take pictures at Pat Morton Lookout, then tour the pleasant surroundings at Wategos Beach, and finally stop by Truly Tea. For other places to visit, ratings, where to stay, and more tourist information, go to the Byron Bay trip planner. You can drive from Gold Coast Hinterland to Byron Bay in 1.5 hours. Traveling from Gold Coast Hinterland in April, plan for little chillier nights in Byron Bay, with lows around 16°C. 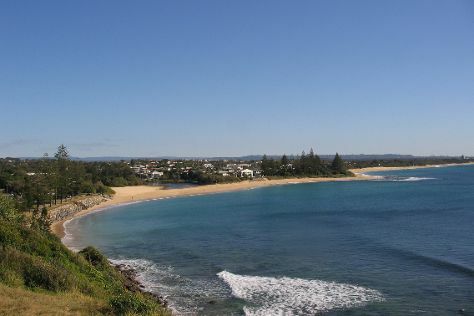 Finish up your sightseeing early on the 24th (Wed) so you can go by car to Port Macquarie. Kick off your visit on the 25th (Thu): do a tasting at Bago Vineyards and Bago Maze, admire the striking features of Port Macquarie Historic Court House, then look for all kinds of wild species at Koala Hospital, and finally pause for some serene contemplation at St Thomas Anglican Church. On your second day here, enjoy the sand and surf at Pilot Beach, take in the awesome beauty at North Brother Mountain, and then stop by Kendall Craft Co-operative. To see maps, ratings, and more tourist information, read our Port Macquarie journey maker app . Traveling by car from Byron Bay to Port Macquarie takes 5 hours. Alternatively, you can do a combination of bus and flight; or take a bus. Expect a bit cooler weather when traveling from Byron Bay in April: highs in Port Macquarie hover around 20°C, while lows dip to 18°C. Finish up your sightseeing early on the 26th (Fri) so you can go by car to Newcastle. Start off your visit on the 21st (Sun): stop by Newcastle City Farmers Market, kick back and relax at Newcastle Beach, and then take some stellar pictures from Shepherds Hill Fort. To see where to stay, ratings, traveler tips, and tourist information, read our Newcastle online tour itinerary planner . Drive from Port Macquarie to Newcastle in 3 hours. Alternatively, you can take a bus; or do a combination of flight and train. Expect a bit warmer weather when traveling from Port Macquarie in April: highs in Newcastle hover around 27°C, while lows dip to 15°C. Finish your sightseeing early on the 21st (Sun) to allow enough time to drive back home.